âCheerleading detracts from the sports (track and field)…. It takes a lot of time to organize and after it is complete, to restart is another problem,â Williams told SEARCHLIGHT. Williams, who is presently acting director of sports and physical education, noted as well that too much emphasis is placed on the cheerleading and not the actual preparation of the athletes for the various track and field events. âCheerleading in some schools seems to be more important than the events themselves; thus it becomes the main attraction,â Williams said. The experienced official also thinks that the cheerleading concept is being misinterpreted. âIf you have cheerleaders at your sports meet, it is to cheer on the houses,â Williams advanced. 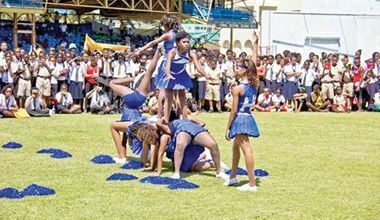 âCheerleading is a sport and not an event, so it is better to have it on a separate day from your sports meet… Schools then can use it to raise funds to finance their meet,â Williams suggested. While several schools here have embraced and endorsed the âcheerleadingâ fad, some schools have either toned down the activity or have removed it entirely from the list of activities which comprise their track and field meets. Others have instituted restrictions which limit excessive gyration, spilling, flipping and other contortions. But entertainer and adjudicator of many cheerleading competitions Marla Nanton has a different view. Nanton sees cheerleading as part of total package at a sports event. âSports should be sold as an entertainment package… It is a total thing … Yes, it is about track and field, it is about athletics, but at the end of the day, spectators come for some sort of entertainment … To add value to the whole package and cheerleading adds a hype to it,â Nanton opined.